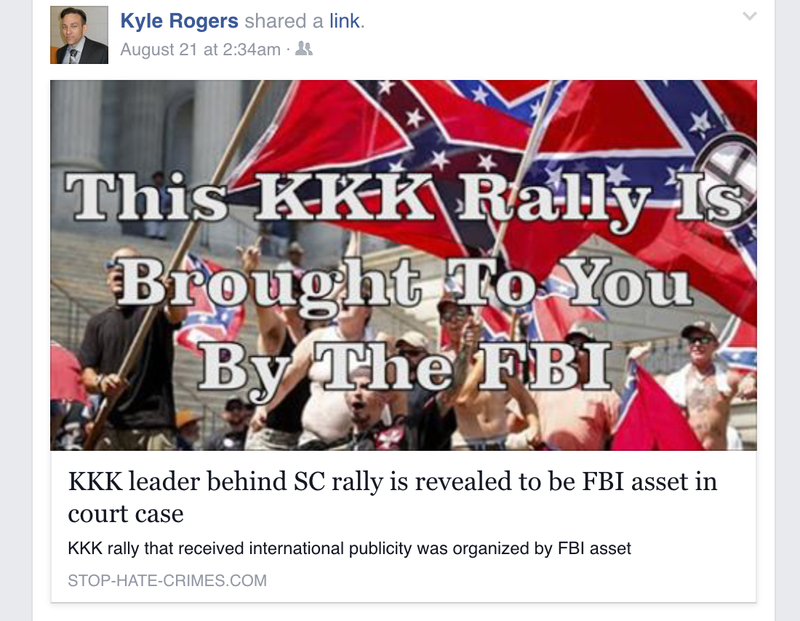 Yes Everyone knew the SC KKK Rally was an FBI Set Up! Did You? Everyone apparently but phony confederate heritage and flag fetishist Connie Chastain and Council of Conservative Citizens Kyle “I inspire mass shootings” Rogers who are both quite late to the game. 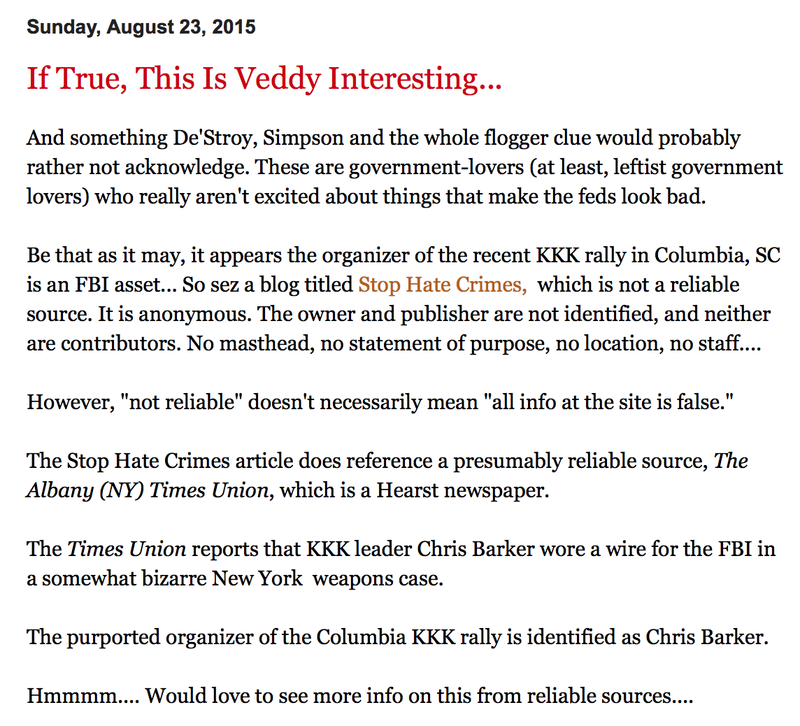 Connie devolves herself even lower than usual in her latest post when she refers to an article from the blog Stop Hate Crimes stating that KKK wizzie Chris Barker, who set up the rally is an FBI informant. Can this woman chew gum and walk at the same time? Now, granted this Stop Hate Crimes blog is also a bit late to the game as it is posting the well researched information from the award winning anti-Klan investigative journalist Nate Thayer who published this information on his blog the day before the rally on July 17th. If Connie took the brain power to actually click on the links provided in the SHC article all the proof of the information would have been provided for her with a link to the Nate Thayer article. Everyone in the leftist/anti-racist community knew about this, nobody gave it much mind because most people were just interesting in making whichever KKK racist supporters who showed up wet their pants. One People’s Project also knew about this and wrote up about it on July 19th. In fact, the head of the Loyal White Knights, a convicted felon named Christopher Eugene Barker reportedly did not attend because it would violate the conditions of his parole, but his wife Amanda, under who’s name the rally permit was under, did attend. With a long rap sheet that includes a recent conviction for conspiring to build a nuclear weapon, Chris Barker is also considered a liability in White supremacist circles because he reportedly has been working with the Joint Terrorism Task Force (JTTF) since 2012. Barker goes by a number of aliases, including the name “Robert Jones”, which was the name of a North Carolina Grand Dragon from the 1960s. Despite the LWK boasting that they would have over 200 Klansmen in attendence, only seven persons could be identified as Klan while the NSM made up most of the approximately 50 persons that stood on the Statehouse steps. OPP even linked to Thayer’s July 17th article about Barker. As leftists we know that every big rally is an FBI honeypot littered with informant/plants and instigators. We’re used to dealing with it and can spot it pretty easily. It’s obvious that the Flaggers are oblivious to the Feds amongst their own. Most of them are not wise to the ways of the world, or the protest scene. They think planting an ugly flag where it is not welcome is some kind of battle victory, when really it’s about as equal to farting in someone else’s church. Yes, you made your big stink and walk out, now everyone else is stuck with it. Wow, winning friends? NOT! Can you say Fed HONEYPOT? 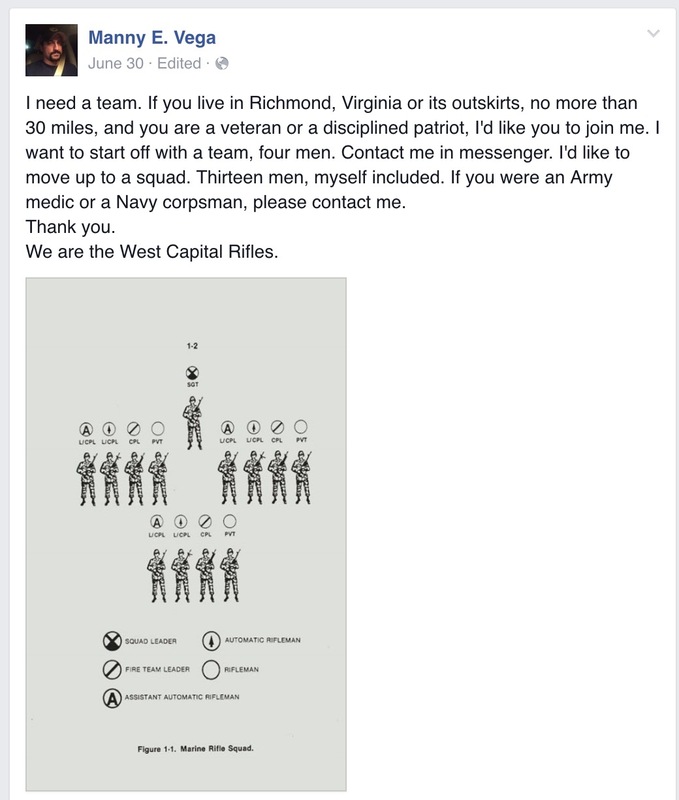 Yeah, because real militias post on Facebook to organize idiots with guns? 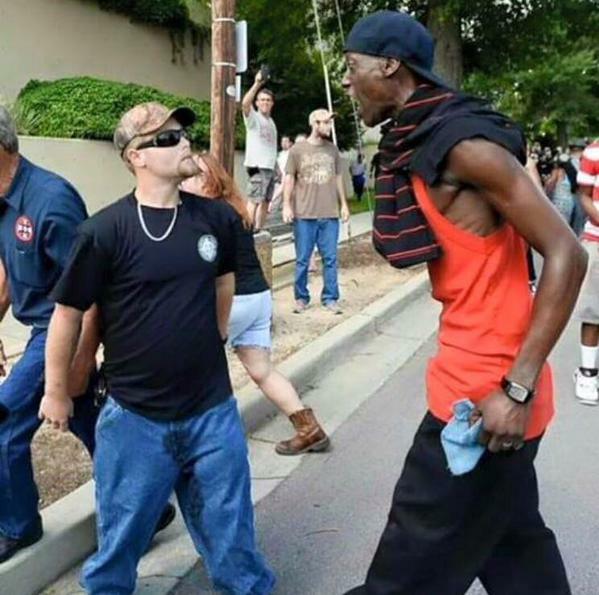 2 Responses to Yes Everyone knew the SC KKK Rally was an FBI Set Up! Did You? Hey, thanks for opening my eyes to the reality of just how evil and dangerous you destroyers are. So says the woman who is too stupid to understand how macaroni salad is made (cooked macaroni and mayonnaise dressing, I mean honestly!) 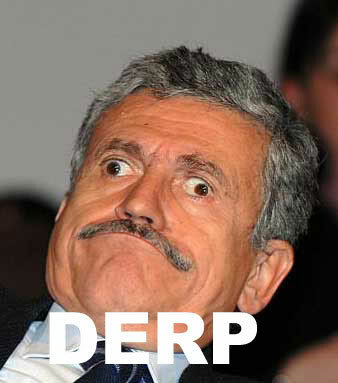 it’s no wonder she has the reading and comprehension skills of turnip. Go back to your fantasies, Con-nay-nay, you’re nothing more than a babbling drunk in a trailer home nestled in a swamp.